The three courses are designed to give actors a comprehensive understanding of the skills required to deliver an on-camera performance with professionalism and confidence. Starting with a basic introduction to the actor’s craft, actors will address the technical challenges required to perform on-camera as well as the skills necessary to learn and interpret scripts, how to prepare for an audition, and the do’s and don’t’s of audition protocol. Actors will present a series of commercial and drama scripts in performance which will be recorded, enabling detailed feedback from the tutor and other participants. Actors learn the basics of the actor’s craft through exercises designed to develop technical skill and confidence which will be invaluable in auditions. All work is recorded on camera, facilitating feedback from the tutor and fellow actors. 1. Introduction to the basics of acting and reacting. Awareness of self and other actors. Basic improvisation skills. 2. Understanding the actor’s goals and objectives when delivering a performance. Saying ‘yes’ to other actors. 3. Preparing for an audition. Audition protocol. Being confident in the audition. Getting feedback from an audition. 4. Presentation and promotion: understanding the motivation behind commercials. Learn how to promote the self, others, ideas and ‘products’, using actual commercial scripts. 5. Spontaneity in performance. Presenting unprepared topics with clarity and confidence. Learn a commercial script ready to deliver under audition conditions. 6. Presentation of commercial scripts under audition conditions. Playback and feedback from tutor and fellow actors. Actors learn to understand the role of the camera in performance, the skills required to interpret and deliver a variety of drama scripts, understanding the principles of motivation, objectives and conflict. As with the introductory course, all work is recorded on camera for the purpose of constructive criticism. 1. Introduction to the basics of acting with ‘objective’ and ‘motivation’. 2. Understanding the principles of ‘conflict’ and ‘sub-text’ in drama. 3. Learning the difference between ‘stage acting’ and ‘camera acting’. Understanding the role of the camera in performance, how to relate to the camera, differentiating between ‘mid-shot’ and ‘close-up’ performance. 4. Script interpretation. The fundamentals of developing character. How to prepare a script thoroughly before an audition. 5. Work-shopping a drama script. Working with the ‘reader’. Understanding and responding to a casting director’s feedback. Learning to change your performance as directed. 6. Presentation of drama scripts under audition conditions. Playback and feedback from tutor and fellow actors. The advanced course takes the form of a series of audition workshops in which actors explore a variety of scripts, both dialogue and monologue. Actors will get practice in auditioning regularly scripts they have prepared the previous week and will also be introduced to the monologue. 1. The first session will be devoted to understanding the principles of the monologue. Exercises will introduce the concept in a simple, yet effective way. 2. Actors will workshop and perform a monologue on camera. Playback will allow constructive criticism from the tutor and fellow actors. 3. Audition Workshop I: Actors deliver a prepared monologue under audition conditions, with feedback and criticism. 4. Audition Workshop II: Presentation of scripted dialogue. 5. Audition Workshop III: Presentation of scripted dialogue. 6. Audition Workshop IV: Presentation of scripted dialogue. Paul Norell has been an actor and teacher of drama for over thirty years and, for five years was co-director of ACTION WORKSHOPS a joint casting/audition tuition agency based in Auckland, auditioning actors for commercials as well as TV dramas such as Street Legal and Orange Roughies. Paul has extensive stage acting experience both at amateur and professional level and has appeared in featured roles in many TV series, including Shortland Street, Mercy Peak, Hercules: The Legendary Journeys and Xena: Warrior Princess. 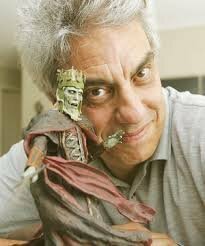 Paul is best known in New Zealand and overseas for his role as the ‘King of the Dead’ in Lord of the Rings – The Return of the King. Paul has worked with BGT actors on previous occasions and currently tutors private students in camera audition techniques. If if you wish to secure your place please deposit $300 for course Number 1 into our business account 12-3045-0566941-00 - once we have 8 students we will confirm the class. Once paid please email sarah@bgt.nz With your name - we are only filling Level one at this stage. Hi Paul, at the end of level one, I just wanted to tell you how much I enjoyed it. This course was exactly what I expected, that is, a very thorough introduction to camera work. I had never had any real insight into what a filmed audition was, but now I feel it won't be a brand new frightening experience would I be called for a real one some day. I appreciated your patience and your kindness in front of our hesitations and beginners' mistakes and approximations. You are a real great teacher who always has a nice and encouraging word to everyone and your sense of humour is very welcome when we feel a bit lost and confused in front of the camera monster! Merci pour tout! J'ai vraiment hate de commencer le deuxieme niveau avec toi et toute la bande!